This deck was a very nice surprise! It is a tarot deck for cat people, folks, if you weren’t sure of it from the title, and even more so than I expected at the start. In the interest of full disclosure, I am a proud father of three feline daughters. Debra Griffin—also known as Doctor Griffin—has been a practicing veterinarian for 28 years. For 22 of those years, she has treated feline patients exclusively. She has a very close kinship with cats, and that spiritual connection spurred her to undertake a cat tarot deck. 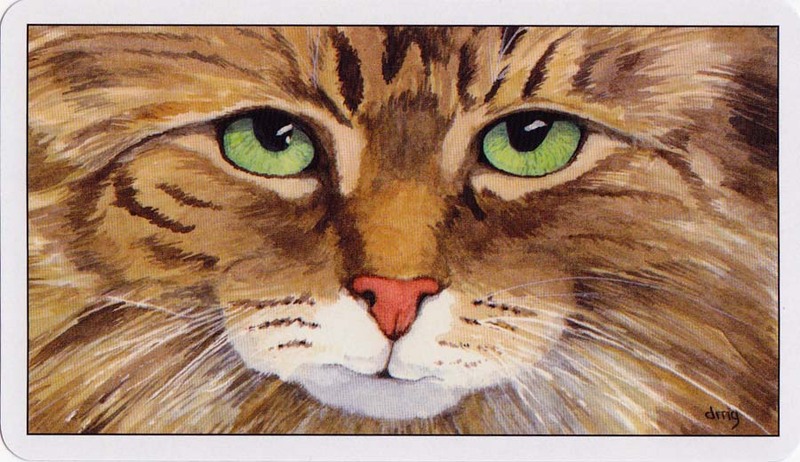 The back of the cards is adorned with—you guessed it—a very lifelike cat face looking rather serious with green eyes. It’s almost like it’s staring right through you, but not in an unnerving way. Cat people will immediately think of the “Shouldn’t you be doing something for me right now, human?” stare that they receive around the cat’s mealtime. What I like most about it is that it is portrayed across the length of the card so the face is about life-size for many cats. Griffin refers to her deck as “uncluttered” in the LWB and I completely agree. The illustrations on the cards are artistic, but they capture the essence of cat behavior extremely well. We have cats in many various poses—hiding, playing, and resting—and many in which they’re just being themselves. 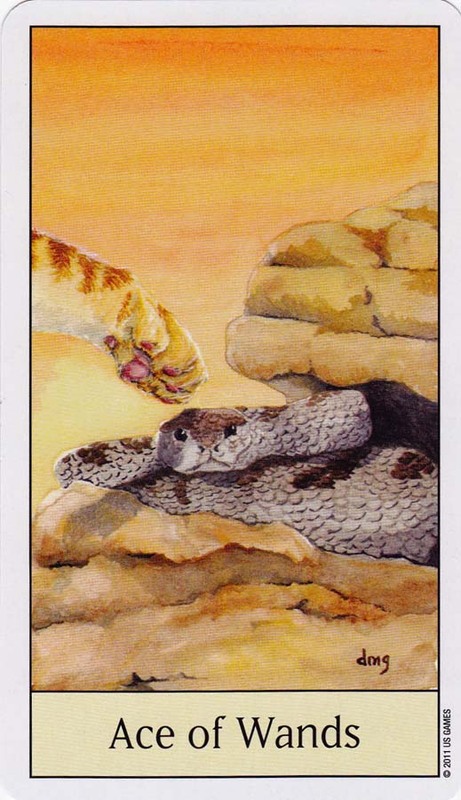 One of the reasons I like the images so much is that they speak for themselves; there are very few “symbols” on the card in addition to the animals, and that makes for a clarity that I rarely see in a tarot deck. You’ll see a few nods to standard RWS imagery here and there—the Empress is present with her kittens, and the Wheel of Fortune has a wagon wheel—but overall the cards are uncomplicated. Cats are not the only animals on the cards, though. While felines rule the majors, each one of the suits was selected with a particular animal and cat color to enhance the meanings. 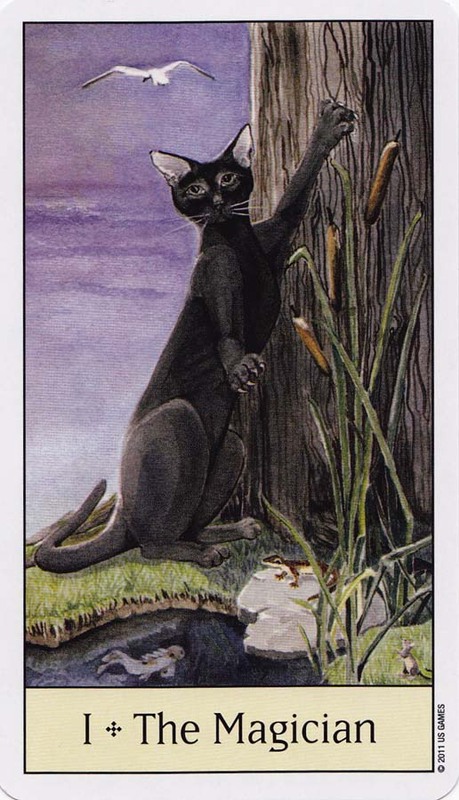 Pentacles cards have brown tabbies, for example, and feature mice as the preferred prey item. Swords, on the other hand, reinforce the air element and are represented by the talkative Siamese cats, and show birds as well as the cats. Suits have the standard associated for RWS decks. I also like that these cats are for the most part adult cats, and not kittens. 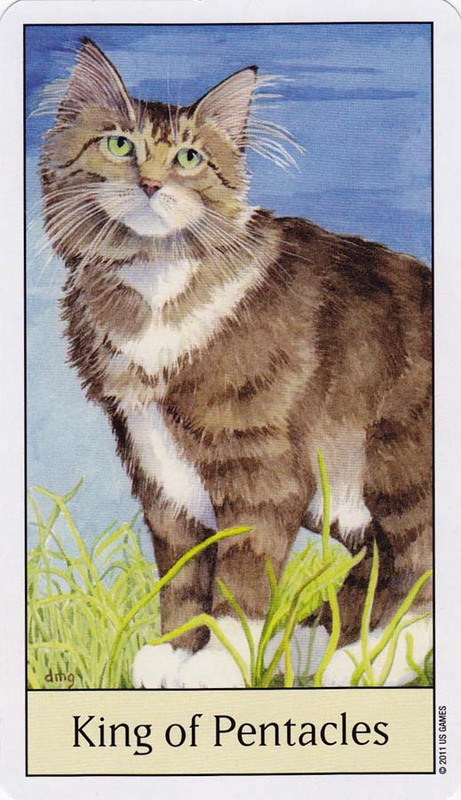 OK, OK…I’ll be the first to admit that I love cute kittens, but the fact that these are adult cats gives the deck a maturity that it wouldn’t have had with playful kittens on every card. I’m sure I wouldn’t have been as fond of the deck, either. 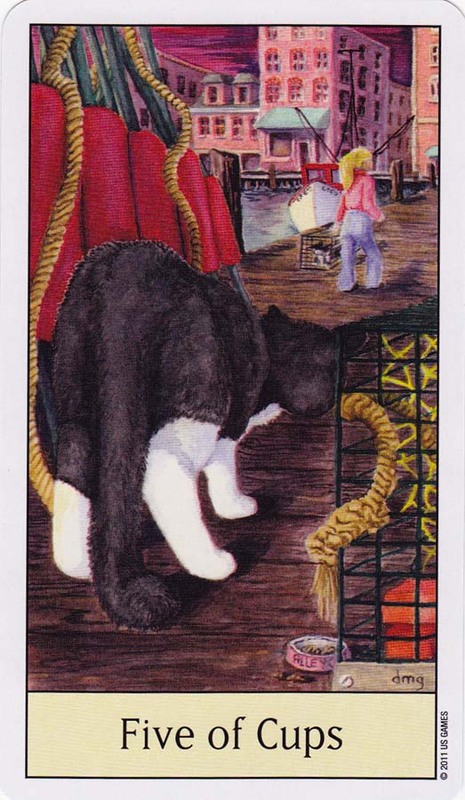 My obvious bias toward cats aside, this is a great to give to a tarot beginner. I’m really fond of the images and their simple yet powerful tone, and combining it with Joan Bunning’s meanings and only one spread was a stroke of genius. This would also make a great gift for the ailurophiles in your life—even non-tarot people would enjoy these beautiful images of cats.